The Bozeman Gem & Mineral Club hosts an annual show in late Spring at the Gallatin County Fairgrounds. The primary purpose of the show is to acquaint the general public with our hobby and share the beauty of, and fascination with, our displayed collections. It is also a great place to meet other rockhounds, add to your collection from dealer offerings, and provide a variety of fun and inexpensive activities for young visitors. An admission fee is usually charged non-members to cover the costs of putting on the show. A successful show is the cooperative effort of all club members. The Montana Council of Rock & Mineral Clubs: An association of Gem & Mineral clubs in the State, the Montana Council promotes interest in rockhounding through education of members, schools, and the general public about the hobby. The Council also helps members stay informed regarding legislative and regulatory matters that impact field access and collecting. The Council makes most gem & mineral shows in the State possible; It owns, and makes available to member clubs, the showcases that are used for displays at the shows, and it provides the trailer to transport them. The Northwest Federation of Mineralogical Societies: An association of rock clubs in Alaska, Idaho, Montana, Oregon, Utah and Washington, the Federation sponsors an annual show, hosted by a member club. Members from throughout the clubs of the Federation participate in the Federation shows and clubs send delegates to the Federation business meetings held during the show. The NFMS also sponsors a variety of lapidary arts workshops and field collecting trips, and loans DVD and slide show presentations to member clubs for monthly meeting programs. The American Federation of Mineralogical Societies: An association of rock clubs throughout the United States, the American Federation, in cooperation with regional Federations, sponsors a variety of programs including the offering of student scholarships, education of members and the general public about rockhounding, and fostering international relations. Belonging to these associations provides contact with rockhounds from around the state, region, and country, often leading to field trips to areas we might not otherwise be aware of. It also brings guests from other areas to our club meetings with samples of materials from their area. Our club has enjoyed guests from several states and foreign countries. Club-owned or donated materials are displayed in the County Courthouse and often loaned for display to area museums. Club-owned or loaned, gems and minerals are on display in the Montana case at the Gallatin Yellowstone Airport. When weather permits, club members try to get in at least one field trip per month. Most are one-day excursions to a collecting site for a particular material. On past field trips, participants have collected garnets, petrified wood, tourmaline needles, rhyolite, jasper, agate, calcite, sapphires, corundum, and various varieties of quartz crystals (including amethyst). The club currently maintains 2 quartz mining claims in the Highlands area (SW of Whitehall) and in the Boulder Batholith. As well as collecting opportunities, field trips provide a time to become better acquainted with fellow club members while sharing an enjoyable, and occasionally exciting, time. Unless otherwise specified, all meetings are 7:00 pm, as specified in the sidebar. Tucson, AZ: Annual Tucson Gem and Mineral Show, February 14 - 17, 2019, Tucson Convention Center, Tucson AZ. Note that there are actually several shows in Tucson, starting January 19, and running through February 1. For more information see: http://www.tgms.org/show/. Missoula, MT: Hellgate Mineral Society Rock Show, March 16 -17, Hilton Garden Inn; 3720 North Reserve St.
Helena, MT: Helena Mineral Society Rock Show, April 13 - 14, Helena Civic Center. Idaho Falls, ID: Idaho Falls Gem and Mineral Society Rock Show, April 13 - 4, Idaho Falls Recreation Center, B Street. Billings, MT: The Billings Gem and Mineral Club Show, May 4 - 5, Al Bedoo Shrine Auditorium, 1125 Broadway Ave.
Bozeman, MT: The Bozeman Gem & Mineral Club Rock Show, May 11 - 12, at the Gallatin County Fair Grounds, 901 N. Black. Hamilton, MT: The Biterroot Gem and Mineral Society Show, May 18 - 19, at the Ravalli County Fairgrounds, 100 Old Corvallis Road. Butte, MT: The Butte Gem & Mineral Club Rock Show, June 15 - 16, at the Butte Civic Center Annex, 1340 Harrison Ave.
Denver, CO: The Denver Gem and Mineral Show, TBA. Sweetwater Basin, past Ruby Reservoir, May TBD, for garnet and corrudum, and possibly rhyolite (on the way back). Meet at Belgrade Albertsons, at 8:00 am. Memberships are available to anyone interested. Many members start out knowing only two kinds of rocks: pretty ones and ugly ones. With the willing sharing of information and skills by seasoned members, new members quickly learn to identify various rocks, minerals, and gems – and learn how to use and display them. Memberships are available to families or individuals. Annual dues include membership in the Montana Council of Rock & Mineral Clubs and The Northwest Federation of Mineralogical Societies (NFMS), The American Federation of Mineralogical Societies, and subscriptions to A Stone’s Throw (the club’s monthly newsletter), The Montana Council Reporter, and The Northwest Newsletter. Memberships are due between November and the end of January for the new year. Dues may be sent to our address or given to our Treasurer at a meeting. • What are the directions to the July 20, 2013 picnic meeting location? The 2014 location is still to be determined. Drive South 19th St from north or west until you reach the corner of S. 19th and Hyalite (Canyon) Road (Approx 5-6 miles south of Kagy or 1 mile east of Cottonwood). Turn south on Hyalite Rd as though you are heading for Hyalite Revervoir. Turn at the second left-turning road -- Canyon Meadow Rd. (If you drive over a cattle guard on Hyalite Rd, you've just passed Canyon Meadow Rd and need to turn around). On Canyon Meadow Rd, go east to the end (cul-de-sac). Brownish house address is # 146 -- only a few houses on the street. Call Ken or Carol at 582-8752 if you are lost. • What should I consider bringing on a field trip? When going out for a day of rock-hounding, consider where we will be going and ask the trip leader what he/she suggests. Some areas are very isolated, so come prepared with the basics. These include a backpack for carrying food and water, sunscreen, bug spray, and tools. Lunch is your choice – bring what you like; remember to bring some snacks and plenty of water. Other items you might want to include would be a small first-aid kit, toilet paper, sunscreen, bug spray, eyewash, and tweezers. Bear spray is a good option when hiking in the mountains. The right clothing can make the outing more enjoyable. Bringing a hat or vest in hunter orange or bright pink could be helpful as these colors make you easier to find in case of accident. Temperatures can change quickly, so layering is suggested and long sleeves, hats (especially wide-brimmed varieties) are a good option; sturdy hiking shoes, gloves, and raincoat or poncho. Water-soaked (evaporative-cooled) neck wraps on hot days. Walking sticks are also useful. Please police the area you are leaving and take out any food wrappers or garbage. We carry out what we carry in -- plus rocks of course. Do not dig under living trees in the rootball or cut large roots of living trees. Deciding which tools to bring depends on the outing and whether you will be hiking short or long distances. Driving directly to a site allows for the use of larger, heavier tools. Hiking longer distances usually limits the amount of weight you want to carry. Members carry most of the tools with them in their vehicles, giving them the option to decide which tools they want to take to the collecting site. The club is always looking for more efficient and interesting new tools that make rock hounding easier and more enjoyable; so if you have suggestions for tools that are not on the list, please let us know. • What are the directions to our Club's #1 clear quartz crystal claim? This claim in the Highlands area in the Beaverhead - Deerlodge National Forest is accessible for use only by active Club members. Simply call or email Ken Zahn (406-582-8752) (kczahn@littleappletech.com) and directions will be provided. A 4x4 vehicle will be needed. • If I want to rent the Hell's Canyon Ranger Station cabin near Claim #1, how do I do it? 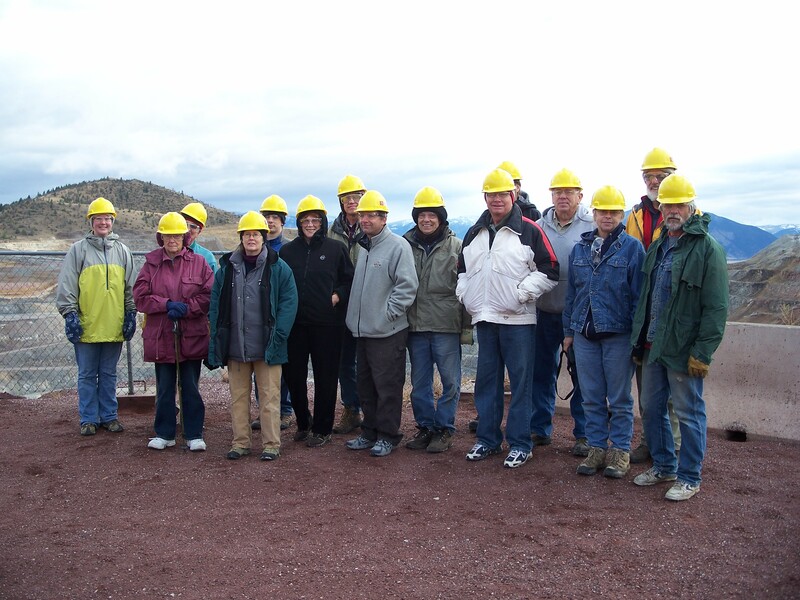 • What was the info presented at the April 2012 Club meeting on collecting sites in Utah? • Gold Placers in Utah; UGMS Circular 47; 1966. • Great Examples; scroll down about ½ way to 9 pictures. • Mineralogical Record, Vol 27, pg 59n. • Classic Fairfield (Clay Canyon near Toelle) locations closed & reclaimed. This is not a complete list of rock, gem, and mineral clubs. Some clubs may not meet during the summer months. Times, dates, and addresses of meetings may change without notice. If you are aware of any changes, please pass this information on to christinewilkerson@utah.gov. Odgen, UT 84402. Meets 4th Thursday of each month, 7:00 p.m., in the commons room of the Ogden-Hinkley Airport Terminal 3900 South Airport road, Odgen, Utah. Cache Geological and Archeological Society, P.O. Box 3690, Logan, UT 84323. Meets 2nd Thursday of each month, 7:00 p.m., Logan City Library. Meets 2nd Tuesday of each month, 7:00 p.m., Senior Citizens Room, Garfield County Courthouse, 55 South Main Street, Panguitch, Utah. Dixie Rockhounds St. George, UT. Unsure if this club still exists (08/05/2010). Moab Points & Pebbles Rock Club, P.O. Box 1459, Moab, UT 84532. Meets 3rd Thursday of each month, 7:00 p.m., Grand Center,182 N, 500 W, Moab, Utah. Tooele, UT 84074. Meets 2nd Tuesday of each month, 7:30 p.m., Senior Citizens Center, 59 East Vine Street, Tooele, Utah. Wasatch Gem and Mineral Society, P.O. Box 1397, Sandy, Utah 84091. Meeting: 3rd Monday of each month at 7:30 p.m. at Bicentennial Hall in Sandy, 530 E. 8680 S.
Utah Gold Prospectors Club; Phillip J. Yadanza, President, West Valley City, UT, 801-965-1662, Internet: www.utahgold.org (current as of 2/15/11). Northern Utah Prospectors Association; P.O. Box 13301 Ogden, UT 84412; Internet: nupainc.org (current as of 2/15/11). Also check under Metal Detecting Equipment and Rock Shops in the telephone directory. Non-Profit Status: BGMC is incorporated in Montana and has IRS 501(c)(3) status. Lifetime member of the Museum of the Rockies.